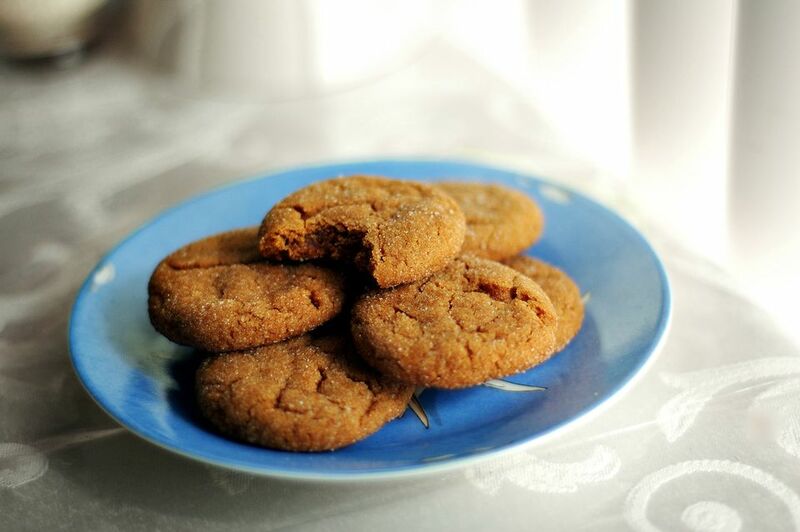 Gluten-free molasses ginger cookies are big cookies with a pronounced molasses flavor. This is a sturdy cookie, perfect for lunchboxes or travel snacks. This recipe is made with a convenient gluten-free flour blend but use your favorite homemade blend or ready-made gluten-free flour blend. If you use a ready-made flour blend check to see if xanthan gum or guar gum is included in the ingredients list. If it contains a gum there's no need to add the gum called for in the recipe. Line 2 large baking sheets with parchment paper or Silpat mats or lightly grease. Combine dry ingredients in a medium bowl and whisk to thoroughly combine. Place sugar, shortening, egg, and molasses in a large mixing bowl. Beat on high until fluffy and combined, about 2 minutes. Add dry ingredients and beat on medium speed to combine. Use a 2 tablespoon ice cream scoop to form uniform sized cookies or scoop 2 tablespoons out of bowl to form a ball about the size of a walnut. Place scoops or balls about 3-inches apart on baking sheets - about 9 cookies per baking sheet. Bake in preheated oven for about 15 minutes or until tops begin to crack and cookies are firm to the touch. Cool on rack.